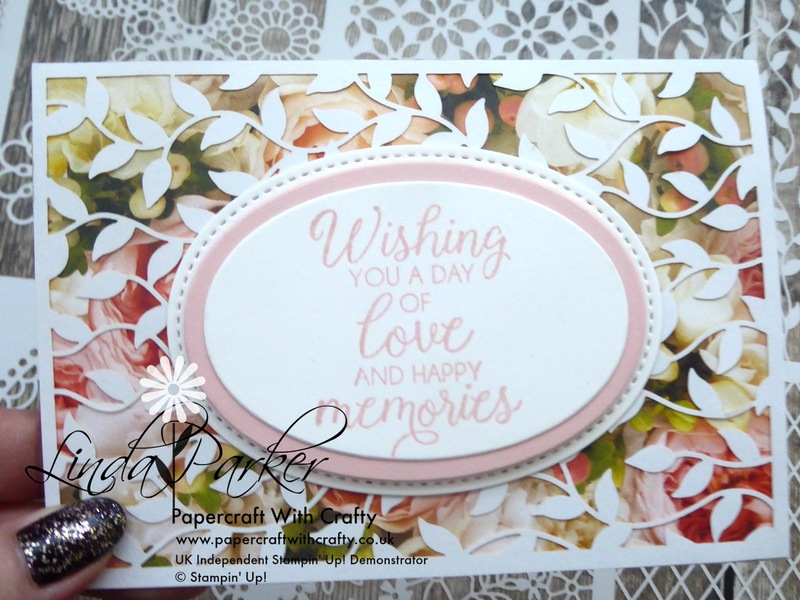 Today's card uses the beautiful Petal Promenade Designer Series Papers, which I have used throughout most of this week for my projects. This time I have added a really pretty laser-cut overlay. The overlay is from the Delightfully Detailed Laser-Cut Specialty Papers which are proving to be just as popular as the Petal Promenade papers. I think the two work especially together in creating a very feminine little card. The laser-cut frames which form part of the designs in the pack are the perfect size for using with Stampin' Up!s Note Cards and Envelopes. One side of the papers is white, whilst the reverse is more creamy like Very Vanilla card stock. The Delightfully Detailed Laser-Cut papers are exceptionally delicate to work with, as the paper has a very lightweight fine quality. Hope you like my project today - I have another Petal Promenade project coming up next week. I can't get enough of those papers. Thanks for looking - and have a lovely weekend.